Hemp has recently seen a resurgence with many US states allowing for Industrial Hemp cultivation. Industrial hemp had been banned back in the 1930’s and until recent times was really only grown and processed in Europe. This ban had to do with it’s relationship with marijuana that has psychoactive effects. While hemp and marijuana are both Cannabis Sativa L, Industrial Hemp has a THC level of .3% or less and does not have any psychoactive effects. On the contrary there are several positive effects adding hemp to your diet can provide. 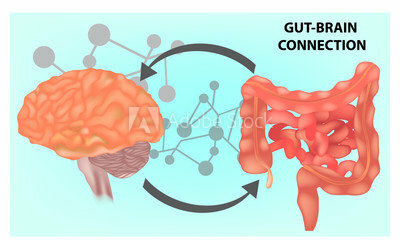 In recent studies gut health has been a core subject and has been referred to as the bodies second brain. Did you know that the gut microbiome refers to all the microbes in your intestines, which act as another organ that’s crucial for your health? Bacteria, viruses, fungi and other microscopic living things are referred to as microorganisms, or microbes, for short. Trillions of these microbes exist mainly inside your intestines and on your skin. Most of the microbes in your intestines are found in a “pocket” of your large intestine called the cecum, and they are referred to as the gut microbiome. Although diverse types of microbes live inside you, bacteria are the most studied. There are actually more bacterial cells in your body than human cells. There are roughly 40 trillion bacterial cells in your body and only 30 trillion human cells. That means you are more bacteria than human. What’s more, there are up to 1,000 species of bacteria in the human gut microbiome, and each of them plays a different role in your body. Altogether, these microbes may weigh as much as 2–5 pounds, which is roughly the weight of another important organ, your brain. Together they function as another organ in your body that plays a significant role in your health. Polyunsaturated Omega-3: This is alpha-linoleic acid; it’s a short-chain fatty acid (SCFA) that forms the basis for EPA and DHA. The short-chain form is best found from plant sources, notably hemp seed. must be eaten. Without it, though, you can develop dry skin, lose hair, and have diminished wound healing. Hemp seeds have both these in their protein and it’s one of the few plantbased sources of omega-3s and a rarer form of omega-6 called gamma linoleic acid. 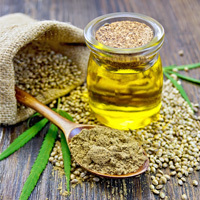 In addition, hemp seed is full of proteins (comparable to soy), magnesium, vitamin E, phosphorous, potassium, and a laundry list of other nutrients that help to promote overall health. The amino acid arginine found in hemp helps the body produce nitric oxide in the body the blood vessels to relax which can help in reducing the risk of heart disease. Now, lets do some comparison. Flax seed has stood out as a nutritional powerhouse for quite some time now and for good reason. Flax seed are considered a complete protein since all nine essential amino acids are present the same as Hemp seed. The difference here is in quantity, Hemp seed contains 10 grams of protein in a 3-tablespoon serving while flax seed contains 5.7 grams of protein in the same 3-tablespoon serving. 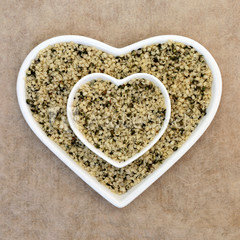 Hemp seed is the highest plant source of essential fatty acids, even more than flax seed. Fiber is where Flax seed will beat Hemp seed. While hemp seed contains 3 grams of fiber in a 3-tablespoon serving, flax seed provides 8.4 grams of fiber in the same size serving size. If adding more fiber to your diet is a primary concern then flax may be your horse, if you’re looking for more of a protein supplement hemp may be what you’re looking for. So, what do they taste like? To me they taste kind of like pine nuts, a very mild nutty flavor. You can eat them straight out of the bag (be careful though, they are small and easy to drop), sprinkle over salads, add them to yogurt, I could make this list much longer but you get the idea. I’m not trying to make any claims that hemp seeds (hearts) are the cure all for nutritional requirements, but I am saying they’re very much worth a try if a complete plant-based protein is desired. With many states across the US starting to grow hemp again we should hopefully see reasonable prices for hemp hearts at the supermarket.